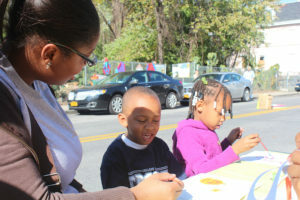 Riverdale, N.Y. – While service is an essential component of the College’s mission, Mount students continually go above and beyond to respond to the immediate needs of the disenfranchised and most vulnerable. This commitment to service exemplifies Mount Saint Vincent’s most fundamental values. It has also earned the College recognition by the Office of the Mayor in the 2017 NYC Volunteers Count report. The recently published report highlights the number of students attending the City’s colleges and universities who volunteered in 2017. Of the 48 colleges and universities throughout NYC, the College of Mount Saint Vincent has ranked in the top five for most student volunteers. These 1,020 Mount volunteers—or as we call them at the College, Leaders in Service—earned recognition for their outstanding efforts during a convening of college and university partners in April 2018. The event served as a forum to discuss service opportunities across the five boroughs and focused on the value of tracking student volunteerism on- and off-campus, which allowed the City’s partners to share their volunteer successes. 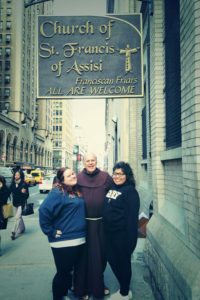 Every incoming Mount Saint Vincent student is encouraged to participate in the College’s rich tradition of service, inspired by the Sisters of Charity of New York. 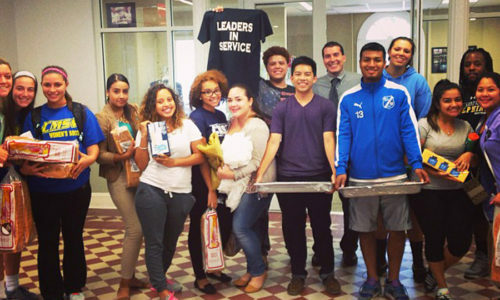 Through an integrated and broad range of programs, the College inspires its students to be Leaders in Service—individuals who respect the dignity of every person, freely share the benefits of their experiences and education, and who understand that true charity is an act of love and respect between equals. The Mount community continues to meet these obligations. Students are dedicated to making a difference in New York, across the country, and abroad. Volunteers frequently coordinate ongoing service projects with on-campus organizations and through local social service agencies to serve meals, care for the environment, tutor and mentor students, visit with those in need, and help the homeless. Be You Stay True hosts free camps for children, encouraging and supporting youth basketball participation. A Moment of Magic Foundation invites volunteers to dress as popular princesses and superheroes to visit children hospitalized over long periods of time. Grand Central Outreach, a weekly student-led outreach program, allows students to prepare and share meals with the homeless in Grand Central Station. 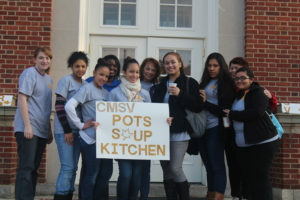 Part of the Solution (POTS), welcomes Mount students to serve in their soup kitchen on Sundays. MASA (the Mexican American Students’ Alliance) partners Mount students with Mexican and Latino children, youth, and families to provide tutoring and mentoring. And the Midnight Run enables student volunteers to travel to midtown Manhattan to hand out food, clothing, and engage in conversation with the homeless. At the Mount, students engage in service to pursue knowledge, develop an understanding and appreciation for individuals from diverse backgrounds, and prepare themselves to address the challenges facing our communities, both locally and globally. This sentiment is true for freshmen, sophomore, junior, and senior students. Each class is just as eager to give back, and the graduating Class of 2018 has been particularly helpful in leading the College’s effort of service and outreach throughout NYC. View more information about our volunteer opportunities and read the 2017 NYC Volunteers Count report. Founded in 1847 by the Sisters of Charity, the College of Mount Saint Vincent offers nationally recognized liberal arts education and a select array of professional fields of study on a landmark campus overlooking the Hudson River. Committed to the education of the whole person, and enriched by the unparalleled cultural, educational and career opportunities of New York City, the College equips students with the knowledge, skills and experiences necessary for lives of achievement, professional accomplishment and leadership in the 21st century.